The first thing you notice about the TF10 is that it is big. With a turbine diameter of 90 cm, it towers over virtually all the previous fan gun models. Its size is also reflected in the snow output. With 24 Quadrijet type nozzles and eight nucleators, the TF10 is one of the most powerful machines on the market. "Our aim was to achieve a major increase in efficiency", said Walter Rieder who heads up the Engineering department at TechnoAlpin. The strength of the machine in borderline temperatures is impressive. 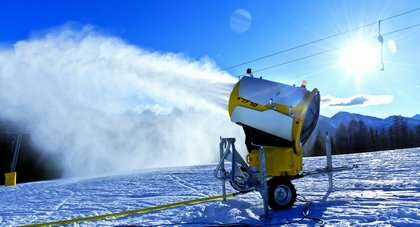 "We delivered an initial test batch this winter and received really positive feedback", added Rieder, "especially at the beginning of the season in borderline temperatures". It is not only the snow output which has been increased but also the projection range. The TF10 has amazing projection capability and distributes the snow over a large area. Moreover, the quality of the snow is consistent over the entire area. The slope preparation time is also significantly reduced. There are 16 control settings which allow for tip-top snow even in changeable outside conditions. 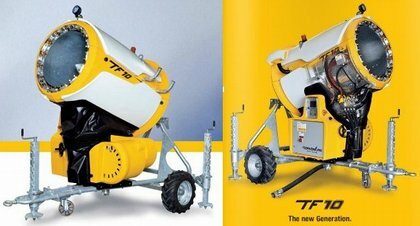 The increased snow output is certainly not the only advantage of the TF10. "The new turbine with internal motor running at 1500 rpm makes the machine insensitive to vibrations and significantly reduces the noise emissions", continued Rieder, "and the lower frequency of the TF10 also means it has a much more pleasant sound". 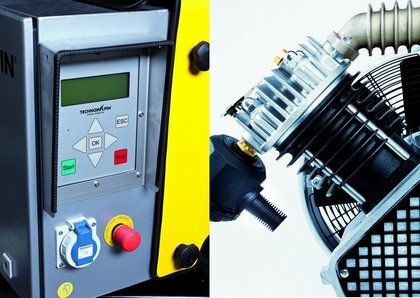 The main units, such as the motor, compressor, electric cabinet and valve block, have been cleverly arranged around the centre line, and the center of gravity has been lowered, thus further increasing the machine's maneuverability and balance. The other outstanding feature of the TF10 is its user-friendliness. The functions which are frequently required, such as height adjustment, keyboard, release rotation and emergency off, are all on the same side of the machine. The well-proven seamless WEDGE WIRE stainless steel filter insert is also used in the TF10. The height adjustment facility with angular gear and a ratio of 2:1 is new and greatly simplifies the height setting process. The keyboard, complete with graphical user interface, color monitor and LED-backlit keys, is integrated in the cover and has inbuilt protection from rain and vandalism. Components which have stood the test of time are retained on the TF10, however, such as the Quadrijet nozzles with ceramic inserts and the oil-free 4kW compressor. "If we had to sum up the TF10, we would say that it represents an entirely new approach in snow-making technology", said Rieder, "and we are convinced that TechnoAlpin will once again set standards with this machine". The Development department at TechnoAlpin has also made a good job of snow generation on the manual side. 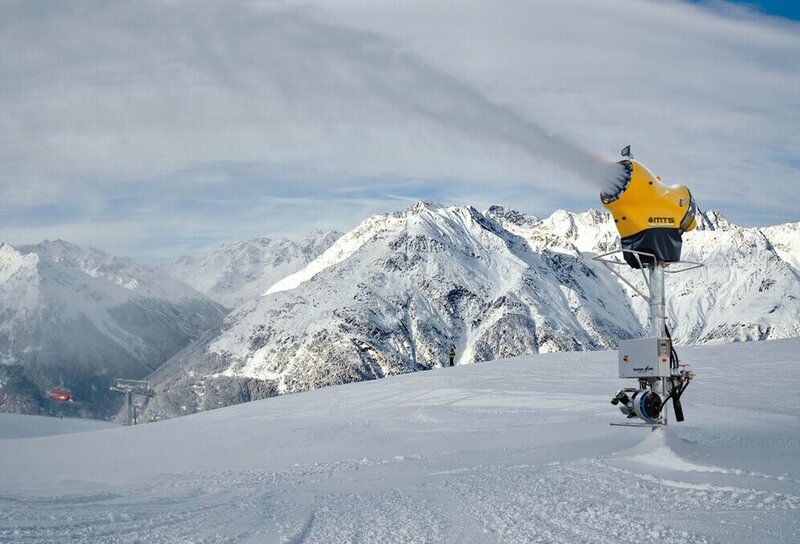 The MMS (Manual Mobile Snowgun) is designed as a mobile snow gun and is intended to complement the tower-mounted MTS (Manual Tower Snowgun). An initial glance will reveal that it is no longer possible for each nozzle to cut in or out individually. The control settings are operated centrally by means of four manual valves on the valve block. With the fixed water setting and four valves which are controlled manually, there are five possible settings. The MMS-type snow guns come with a temperature sensor as standard with the facility of on-screen readouts. 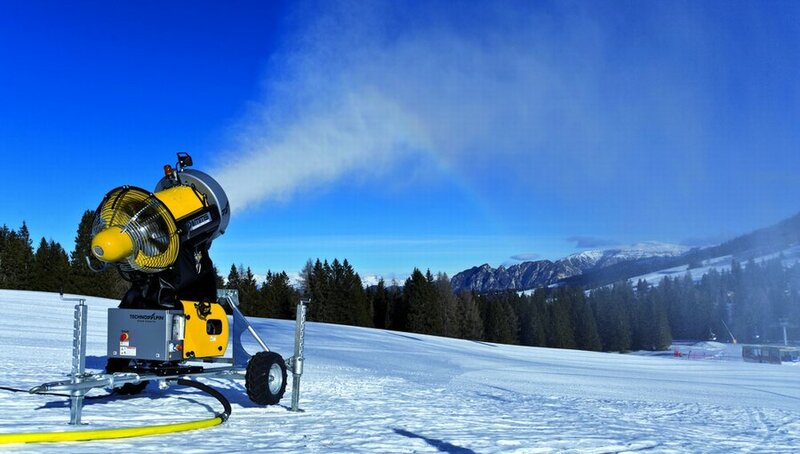 Needless to say, these manual snow guns also boast high-quality materials. Quadrijet nozzles with ceramic inserts and oil-free 4 kW compressor are likewise all part of the package, as is the seamless WEDGE WIRE water filter. The Premium version also comes with the added facility of displaying status and fault messages as well as parameters like the air temperature. The snow quality can also be entered and the software will then calculate the optimum setting according to the prevailing conditions. The MMS can be rotated 360° and has an automatic rotation angle of up to 180°. Therefore the snow lands where it is needed. 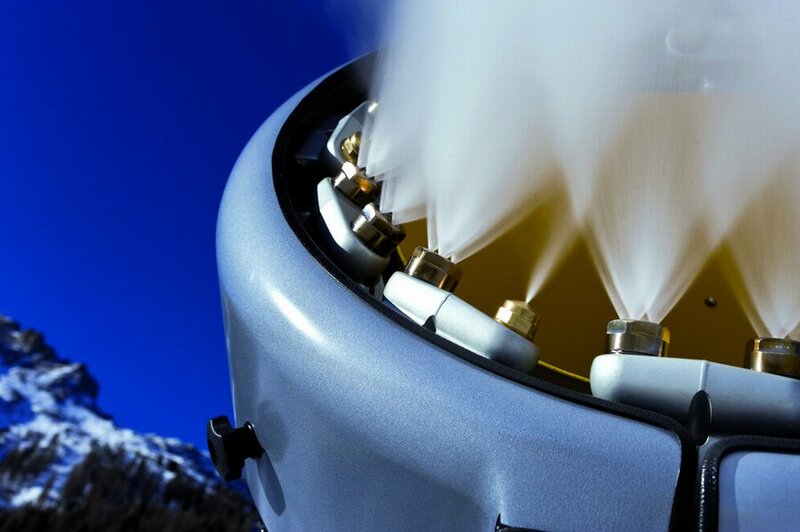 The central water connection at the lowest point of the snow gun is fitted with a discharge mechanism. "The MMS is the perfect symbiosis of old and new components. The controls and settings are much simpler but the snow quality is still as high as ever", said Walter Rieder, summing up the advantages.